I've been warned by the organizer that Joy of Sake -- San Francisco's only major sake-tasting event -- might sell out this year. The Joy is next Thursday (Sept. 9), so the time to buy a ticket is now. The good news is that attendance in San Francisco has been limited this year to 350 people, which should make the event much more comfortable. There are always big positives and negatives to Joy of Sake. It could be better organized and more informative. They should have spit buckets and more easily accessed water pitchers. In my dreams you would be able to order sakes right there, but in fact you'll probably walk out with nothing more than a nice buzz, some tasting notes that you puzzled over (whipped cream? white chocolate? peach fuzz?) and, if you get there early, a belly full of tuna. On the bright side, the sake selection is superb, including many great sakes you can't buy outside of Japan. While the Honolulu and New York events have larger selections, you have to be Alder Yarrow to even consider racing through 178 sakes in 3 hours. I'll taste about 40-50 and be delighted to have the chance. And I'll be sure to taste the 12 sakes that were judged highest at the 10th U.S. Sake Appraisal* (list below). You can pour the sakes yourself. I love that. I get tired of standing around waiting at Family Winemakers, et al, for the sales rep to stop chatting about the weather in Indiana with some other visitor and pour me that next Zinfandel. Here, you can taste at your own pace. And let's go back to that "only major sake-tasting event in San Francisco" bit, shall we? You can blow off any of the great wine tastings the Bay Area has to offer, but if you skip Yoshi's Sake Soiree next week, you'll have to wait another year for a similar chance. So my recommendation, in sum, is this: Buy a ticket (online, here, after you finish reading me of course). Get there early. Stand around outside with me and Alder; we'll be the ones grumbling because there's no trade/media portion. Silently exult that we can't pull privilege as we do at every other tasting. Grab some food immediately -- the food lasted last year until late in the event, but that hasn't always been the case. Very few of the sakes will run out, but popular food items might not last an hour. Then, start tasting some sakes. The daiginjo table is always crowded because those are expensive, but they're not my favorite as a class and might not be yours either. Junmais tend to be fuller-bodied and earthier; junmai ginjos are the most wine-like. Taste a few of each, and taste more bottles near the ones you like. I bring my own paper cup and spit in it. Sake may taste creamy and delicate but it's higher in alcohol than wine; generally 16 to 18%. If you plan to swallow, make transportation plans. After your first 10 sakes you can look around the room and nitpick the event like I have. Wouldn't it be better if more sake experts worked the room? If the sakes were grouped by region? If there was ordering information? Now you're a Sake Soiree veteran. Now about those 12 highest-judged sakes: I'm not a big fan of official sake judgings because I don't buy into the standards. 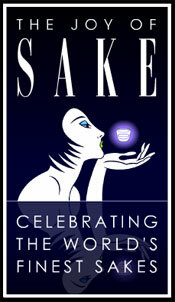 Unlike wine, which is generally judged positively for its good characteristics, sake is judged negatively for its flaws. This means a clean, simple sake will win over a wildly expressive sake. That said, I can hardly criticize a list that has my go-to sake on it. Dewazakura "Dewasansan" Junmai Ginjo (Dewazakura Shuzo) -- Hooray for Dewazakura! This sake is widely available in Bay Area restaurants and I could drink it by the bucket, if they sold it that way. Click here for a random Japanese movie recommendation. Click here and nothing will happen.